Tnx for letting me participate Sean! Brief Synopsis – Sherlock Homes and Watson try to discover the true identity and plot of Jack the Ripper. My Take on it – I have always enjoyed Sherlock Holmes stories because they are usually told in such a way that we are slowly given the clues and get the super smart detective explain it all to us in a simple and understandable way. The plot of this film is unique when looking at Holmes’ adventures because it tries to give us all some kind of answer to an unsolved mystery that still hasn’t been explained in one hundred plus years; the true identity and purpose of Jack the Ripper. Christopher Plummer and James Mason are both superb as Holmes and his sidekick Watson as they work through numerous classes of society trying to uncover the truth about this mystery. The pacing of the story is great and things stay interesting the entire time. The explanation of the whole crime by Holmes towards the end is pricelessly done and is so captivating because of Plummer’s performance as the master detective and of the other supporting characters. Bottom Line – Plummer and Mason are amazing as Homes and Watson. Such an intelligent plot that tries to combine two famous stories that most of us all know about. The movie moves along at a great pace, but the explanation towards the end of it all is really enjoyable to watch mainly due to the performances by the cast. 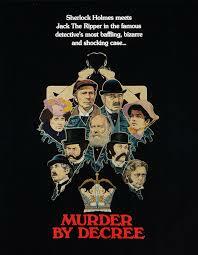 One of my favorite Holmes stories and portrayals despite it not being part of the true canon of Conan Doyle. Recommended!